In a small bowl, combine the gelatin and water; stir to combine. Set aside until the gelatin is absorbed, about 5 minutes. In a medium sized saucepan, dissolve 1/2 cup of the sugar into the coffee over medium heat. Increase the heat and bring the mixture to a boil and cook for 30 seconds. Remove the pan from the heat and add the gelatin mixture, stirring until it dissolves. Set the mixture aside to cool for 20 minutes. Pour the coffee mixture into eight 1 cup capacity glasses and refrigerate until set, about 1-2 hours. Place the chocolates, Kahlúa, and 1/2 cup of the cream in a saucepan over low heat and stir until the chocolate is melted and smooth, about 2-3 minutes. Set aside to cool. Evenly spoon the chocolate mixture over the set coffee jelly mixture and refrigerate for 20 minutes. Place the remaining cream, 1 tablespoon of sugar, and vanilla extract in a bowl and whisk until soft peaks form. 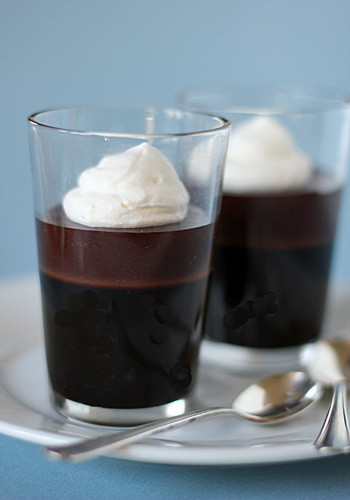 Top the chocolate-layered jellies with the cream and serve. Enjoy! What an enticing menu, and the chocolate jellies are so unique. Thank you for sharing -- wish I could join you! WOW...this looks soooo delicious. I must try it soon. Beautiful photo! Your jellies are so pretty! What a way to welcome in spring.